Article Index: Are You a Past Life Atlantean? Are You a Past-Life Atlantean? 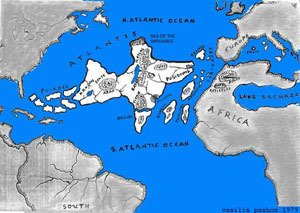 Atlantis is known to most as a possible lost continent, said to have vanished somewhere in the Atlantic Ocean. It was first mentioned in historical text by Plato's dialogues Timaeus and Critias. Since those writings other historical figures have stepped forth and given their own theories and accounts of Atlantis and its inhabitants. Edgar Cayce, a renowned psychic, asserted that Atlantis was located in the Caribbean, proposing that Atlantis was an ancient, now-submerged, highly evolved civilization which had ships and aircraft powered by a mysterious form of energy crystal. It began to emerge after Cayce's readings on Atlantis that this possible civilization seemed to be much more advanced technologically, and that the Atlanteans discovered a power source unrivaled by today's comparisons - crystals. Many believe that amongst the Atlanteans were Magicians of sorts, psychics, and people who could harness the immense healing power of mother earth‘s crystals. Frank Alper goes on to say that the crystals were in every color imaginable, giving each of them specific qualities and vibrations of energy to be utilized. One of the types of crystals that he mentioned being utilized the most in Atlantis was ‘Pink Crystals.' He said of them, “The pink was chosen for these particular crystals to soften, but not weaken the great potential of energy that they produced. Its effect was like striking someone with a sledgehammer while patting them on the head to comfort them.” Utilizing crystals with a pink hue can have the potential to heal advanced cases of disease, while soothing the diseased organ and tissue, not causing any additional pain. It is believed that these energies of Atlantean crystals will be recreated in our own time for similar purposes, especially in the hands of those whom were Atlantean crystal healers, and crystal magicians in past lives. Initially had a negative association with polished quartz, but once held, immense overwhleming power is felt. In earlier life, struggled with being accepted, or finding the true path. Feels nervous about trusting others to touch, or heal oneself. 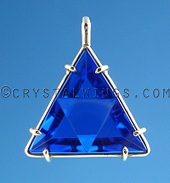 When holding a crystal, a natural instinct of how to use it emerges naturally. Resonates with the number 8. Dreams of an underwater city or crystal city, or working in a crystal cathedral. Memories of, or intense fear of, destruction. 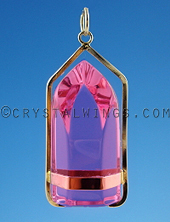 Attracted to Ruby Lavender Quartz, the Lost Stone of Atlantis. Among channelers, crystal aficionados, and past life Atlanteans, Ruby Lavender Quartz has been sought after as the ‘missing link' in crystal healing. Many believe that the red ruby/pink crystal that Frank Alper speaks about above, has been recreated in our own time merged, as Ruby Lavender Quartz. One theory is that it was created by the US government for defense, but refused to cooperate and thus represents unconditional love. 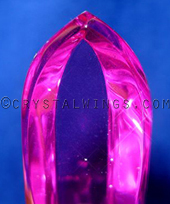 Bill, the owner of Crystal Wings (See his Bio here), had recurring dreams about a stone with a ruby/lavender color, and after reading about it in channelings from Atlantis, began his search. He did find it, and now we provide it for others who feel the same immense power and lovely warmth that it represents. This crystal is being distributed to past life Atlanteans, amongst others, developing a grid of unconditional love, earth healing, and peaceful wisdom all over the earth that is needed in our time. It is interesting to note that Frank Alper discusses not only how the crystals in Atlantis were refined, cut and polished to harness their energy (just like Marcel Vogel taught! ), but also were the source of immense power for the Atlanteans. 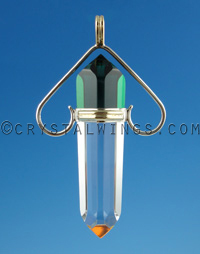 If you are a past life Atlantean, you may feel lost, fatigued, or empty without this energy source, and feel revived, perhaps to tears, when holding a Vogel Crystal or Ruby Lavender Quartz Master Healing Wand. Atlantis represents the unfathomable energy that we have at our disposal within, and with out. Do not be afraid of the power that is within you, and the reflection of your capabilities that is outside of you. Destruction happens when we lose awareness - and awareness is engaged when embarking on the path of crystal healing. Whether you have recollections or believe in past lives or not, you can benefit from the mere notion that perhaps mother earth has more to give us than just crops, air, water, and sunlight - she has at her disposal a arsenal of tools that can enhance your connectedness to all-that-is through all eras of time.